For any artist attempting to ditch the label of one-hit wonder, the next steps they make are crucial. Carly Rae Jepsen – best known for her 2012 hit ‘Call Me Maybe’ – has made no secret of her intentions with her third album, Emotion. Promising fans and critics alike a more sophisticated and structured pop album with plenty of eighties influences, Jepsen has delivered a record so on the money that it stands out as one of the most serious contenders for pop album of the year. With the expectation of eighties flashbacks and mature lyrical themes, the first seconds of album opener ‘Run Away With Me’ deliver with a blasting saxophone riff that could be plucked from the soundtrack of any John Hughes film. “Take me to the feeling,” Jepsen sings as though the words are bursting from her chest, “I’ll be your sinner in secret when the lights go out” – feelings far away from the innocent teenage dreams she wrote before. ‘Emotion’ is not short of proper pop bangers either. 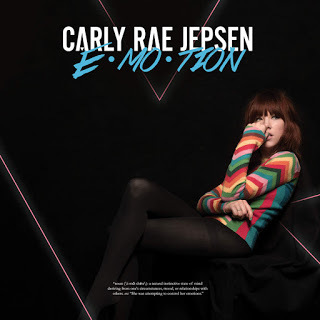 The lead single ‘I Really Like You’ can be viewed as a nod to Jepsen’s previous discography – synchronized pop beats that dance around lyrics describing those early feelings of uncertainty with a crush. However, the real progression can be heard in the production of the track with its savvy drum fills and layered synthesisers that build up the bass. One for playing in the car at full volume. Album closer, ‘When I Needed You’, provides the final touch to a record swimming in nostalgia and flashbacks. Sweet vocal echoes, crisp drums, and more twinkly synthesizers create a track that could be put straight on the playlist for the local roller disco. The melody spins and twirls into a satisfying end – the final curtain on a cinematic addition to Jepsen’s discography. Emotion fulfils all expectations; nostalgic, punchy pop wrapped neatly in a glittery bow. A mature musical progression presents itself in clever production techniques and smart lyrics that go beyond the simple exploration of surface emotions. In 2015, there is not much more to ask for from a pop record.